This User Guide is written for end-users of vcs, rather than developers. If you have suggestions or questions about this documentation, feel free to contact us on UV-CDAT mailing list. vcs specific entities will be formatted like this. The VCS module can accept data from the CDMS module or can use the numpy array. For use on how to use either of the mentioned modules, see their respective documentation. For examples on the direct use of these modules, see the VCS API Examples chapter and the examples located throughout this texts. This is the scientific piece of information that the user is trying to represent for others (or self) to understand. It can be as raw as a simple numpy object. But it is recommended to use [CDMS](https://github.com/uv-cdat/cdms)’s transient variables. CDNS transient variables contain metadata such as name, units, geospatial information, that can be used by VCS to represent data better. This is the most complicated part of VCS but also one of the most powerful. This controls precisely the location of every component on the plot, these control objects are called templates . Templates also contain one exception to the WHAT/HOW./WHERE rule as they control texts information, albeit via [primary](#primary) objects. A description of each primary object is warranted before showing their use and usefulness in VCS. See descriptions below. boxfill - The boxfill graphics method draws color grid cells to represent the data on the VCS - Canvas. Its class symbol or alias is “Gfb”. continents - The continents graphics method draws a predefined, generic set of continental -outlines in a longitude by latitude space. To draw continental outlines, no external data set is required. Its class symbol or alias is “Gcon”. isofill - The isofill graphics method fills the area between selected isolevels (levels of constant value) of a two-dimensional array with a user-specified color. Its class symbol or alias is “Gfi”. isolineobject - The isoline graphics method draws lines of constant value at specified levels in order to graphically represent a two-dimensional array. It also labels the values of these isolines on the VCS Canvas. Its class symbol or alias is “Gi”. outfill - The outfill graphics method fills a set of integer values in any data array. Its primary purpose is to display continents by filling their area as defined by a surface type array that indicates land, ocean, and sea-ice points. Its class symbol or alias is “Gfo”. outline - The Outline graphics method outlines a set of integer values in any data array. Its primary purpose is to display continental outlines as defined by a surface type array that indicates land, ocean, and sea-ice points. Its class symbol or alias is “Go”. scatter - The scatter graphics method displays a scatter plot of two 4-dimensional data arrays, e.g. A(x,y,z,t) and B(x,y,z,t). Its class symbol or alias is “GSp”. vector - The Vector graphics method displays a vector plot of a 2D vector field. Vectors are located at the coordinate locations and point in the direction of the data vector field. Vector magnitudes are the product of data vector field lengths and a scaling factor. Its class symbol or alias is “Gv”. xvsy - The XvsY graphics method displays a line plot from two 1D data arrays, that is X(t) and Y(t), where ‘t’ represents the 1D coordinate values. Its class symbol or alias is “GXY”. xyvsy - The Xyvsy graphics method displays a line plot from a 1D data array, i.e. a plot of X(y) where ‘y’ represents the 1D coordinate values. Its class symbol or alias is “GXy”. Yxvsx - The Yxvsx graphics method displays a line plot from a 1D data array, i.e. a plot of Y(x) where ‘x’ represents the 1D coordinate values. Its class symbol or alias is “GYx”. 3dscalar - The 3dscalar graphics method displays an interactive 3D plot of a 4-dimensional (x,y,z,t) data array. Its class symbol or alias is “3d_scalar”. 3dvector - The 3dvector graphics method displays an interactive 3D plot of a 4-dimensional (x,y,z,t) vector field. Its class symbol or alias is “3d_vector”. template - Picture Template attributes describe where and how segments of a picture will be displayed. The segments are graphical representations of: textual identification of the data formatted values of single-valued dimensions and mean, maximum, and minimum data values axes, tick marks, labels, boxes, lines, and a legend that is graphics-method specific the data. Picture templates describe where to display all segments including the data. Its class symbol or alias is “P”. Array data attribute sets and their associated dimensions are to be modified outside of VCS. See the CDMS2 module documentation for data extraction, creation and manipulation. A description of each secondary object is warranted before showing their use and usefulness in VCS. It is these secondary objects that defines the detailed specification of the primary objects’ attributes. Currently, there are five secondary objects with more to follow. colormap - A colormap contains 240 user-definable colors that are used for graphical displays. The color mixtures are defined in terms of percentages of red, green, and blue colors (0 to 100% for each). The resulting color depends on the specified mixtures of red, green, and blue. Its class symbol or alias is “Cp”. VCS colormaps are objects, but they are not referenced like other secondary objects. fillarea - The fill area attributes are used to display regions defined by closed polygons, which can be filled with a uniform color, a pattern, or a hatch style. Attributes specify the style, color, position, and dimensions of the fill area. Its class symbol or alias is “Tf”. line - The line attributes specify the type, width, and color of the line to be drawn for a graphical display. Its class symbol or alias is “Tl”. marker - The marker attribute specifies graphical symbols, symbol sizes, and colors used in appropriate graphics methods. Its class symbol or alias is “Tm”. textcombined - The text-combined attributes combine the text-table attributes and a text-orientation attributes together. From combining the two classes, the user is able to set attributes for both classes at once (i.e., define the font, spacing, expansion, color index, height, angle, path, vertical alignment, and horizontal alignment). Its class symbol or alias is “Tc”. textorientation - The text-orientation attributes set names that define the height, angel, path, horizontal alignment and vertical alignment. Its class symbol or alias is “To”. texttable - The text-table attributes set names that define the font, spacing, expansion, and color index. Its class symbol or alias is “Tt”. If you use import vcs, then you must prepend “vcs” to certain calls (e.g., vcs.help()). If you use from vcs import *, then you must be aware of possible name clashes. That is, if two packages are imported using the form from name import * and both have a “help” function, then Python doesn’t know which help function to call. For such cases, and indeed as an unspoken rule, it is best to use “import name” to avoid name clashing between packages. There can only be at most 8 VCS Canvas objects initialized at any given time. There are several different ways to display data on the VCS Canvas. The most basic way is to use the plot() function. The simple plot() function command: plot(array1,[array2], [template object], [graphics_method object]). The examples below are showing how to plot a simple array using default values for everything else. # a relative or absolute path might be needed. As mentioned earlier, vcs can use numpy array directly. The example below shows how to plot numpy array data. It should be noted that plot can take multiple arguments. For example, plot can take bg=1 option to draw visualization in the background. 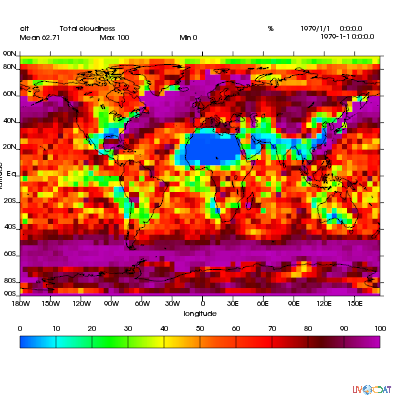 Below is the plotting climate data example with few new options to plot method. When using the plot() function, keep in mind that all keyword arguments must be last. The order of the arguments is not restrictive, just as long as they are before any keyword argument. There are other ways to plot data in VCS. These additional plotting routines utilizes the same parameter format as the plot() function. What makes these plotting functions unique are their direct association with the graphics methods. That is, each graphics method has its own plot function. For example, if the user wishes to plot data using the isofill graphics method, then the function isofill() can be used instead of the plot() function. If the isofill object is not specified then the default isofill graphics method will be used. The user can also pass down the name of the graphics method to be used. In some ways, the graphics method plot functions can be thought of as short cuts to plotting data. Note, if a different graphics method object is specified and passed down to one of these alternate plot functions, then the alternate plot function will behave as the plot() function and plot the data in the specified graphics method format. See table below for additional plot functions. The create functions enables the user to create VCS objects which can be modified directly to produce the desired results. Since the VCS “default” objects do allow modifications, it is best to either create a new VCS object or get an existing one. When a VCS object is created, it is stored in an internal table for later use and/or recall. The get functions are used to obtain VCS objects that exist in the object memory tables. The get function directly manipulates the object’s attributes in memory. If the object is used to display data on a plot and is manipulated by the user, then the plot will be automatically updated. Unwanted VCS objects can be removed from internal memory with the use of the remove function. The remove function will identify the VCS object type and remove it from the appropriate object table. The show function is handy to list VCS objects tables.